Barcodelabelcreator.com offers different types of barcode label creator software to generate linear as well as 2D barcode labels for various kinds of business industries and card maker software to create all types of cards. 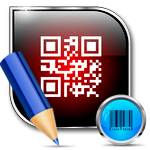 Download barcode creator trial versions to design barcode labels, stickers, images, coupons and rolls for commercial usages. Barcode software generates printable UPC barcode, code 39 labels for your business. We offer complete and professional barcode labels software that creates industry standard barcode business labels using major Linear and 2D barcode label font symbologies. 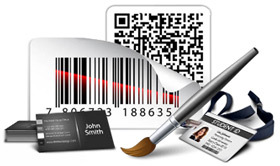 Barcode generator program uses advance barcoding technique to create printable barcode labels, images, stickers and tags to meet your business and personal needs. Barcode label creator program provides accurate and cost effective business solution useful in retail sector, shipping, manufacturing, warehousing industries. Barcode Label Creator - Corporate Edition generates large number of stickers, tags, ribbons and coupons using batch processing system. Label design software generate customized barcode coupons with inbuilt email facility to send generated barcode labels at specified email address. We provide different types card maker software to design labels, tags, stickers, coupons, rolls, birthday cards, business cards, identification cards , wedding cards and other types of cards and labels in various shapes and sizes. With this card designing program, you can create multiple numbers of cards and labels just in few steps. 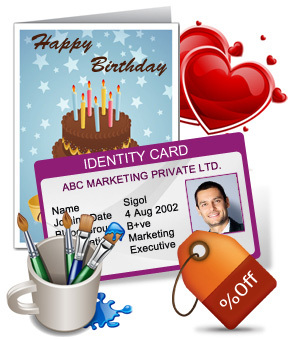 Card maker program creates labels (tags, stickers, birthday cards etc) in rectangle, ellipse and rounded rectangle shapes as per your requirement.